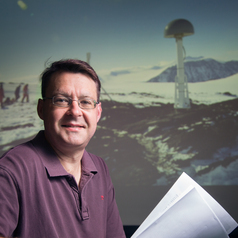 I am Professor of Polar Geodesy and ARC Future Fellow at the University of Tasmania. My field of expertise is geodetic observation of Earth deformation and the global water cycle, including ice-sheet mass balance and sea-level change and particularly using the Global Positioning System (GPS) and the Gravity Recovery and Climate Experiment (GRACE). I also work on reduction of systematic and random errors in these techniques in order to maximise the information content in the data and improve the reliability of the interpretations. I have authored more than 80 peer-reviewed publications including several articles in the leading scientific journals Science, Nature, Nature Geoscience, Nature Climate Change and Proceedings of the National Academy of Science. In 2015 I was awarded the Royal Society (London) Kavli Medal and Lecture (see the lecture at https://royalsociety.org/events/2015/04/continental-loss) and in 2018 I was awarded the Mawson Medal and Lecture by the Australian Academy of Science.